Readers of PrincetonNatureNotes will have noticed a new page layout. I held on to the old one for many years because of a preoccupation with content over appearance, and also liked the narrow verticality of it, akin to walking along a nature trail. But this new format should help navigate more easily from one post to another. If you put your pointer in the upper left hand corner, on "sidebar", a menu should drop down with all sorts of viewing options that are fun to try out. Along the right edge of the page is a slim black bar that, if touched with the pointer, should pop out and offer links to my contact info, categories of posts, a list of other websites, and a way to subscribe to this blog. Next step for me is to update the categories and make it easier to find posts from the same season in past years. I welcome any feedback on this or any other aspects of the blog. May your new year be filled with discoveries while exploring the nature that is all around us. I've been holding back on talking about some truly remarkable creatures that came into our lives this past year. When the pleadings of our 12 year old finally proved too much, I asked around about proper protocol for having chickens in town, and we went ahead and bought some chicks at a local farm supply store in May. Not having had any luck with keeping birds, or particular affection for chickens, I was not optimistic. And yet, over the summer and fall, they have worked their way into our hearts. Gentle, even huggable, imbued with personality and panache, generous in their provision of eggs, they are at the same time surprisingly independent, foraging for much of their diet on their own, living a quiet, unobtrusive life in the backyard. The coop offered a chance to brush up on rusty carpentry skills and put to use materials scavenged from the curb. With the entry of these charismatic creatures into our lives, the outdoors, specifically the backyard, began competing more successfully with all the diversions that tend to keep kids indoors. This is a brief introduction. I'll post more, including more recent research on town poultry policy that made me feel comfortable about blogging on the subject. This hapless spruce tree lost its top in a previous wind storm, then suffered a hit from a black locust felled by Hurricane Sandy. A whole line of black locusts was toppled in Quarry Park by the hurricane. They, like many other fallen trees in town, were located on the west side of a clearing, in this case the parking lot for the Senior Resource Center on Harrison Street. The high winds came from the east, gathered speed in clearings, and then walloped the trees on the far side. I, too, lost a tree situated like this, on the west side of a playfield. A similar pattern is noticeable where winds gathering speed across the meadows of Tusculum slammed into the forests of Mountain Lakes, and in the devastation of a 200 year old grove of trees just west of a long stretch of Carnegie Lake. One question is whether the extraordinary damage has been caused only by the excessive wind speed or if recent high winds came from an unusual direction. We're all wondering if the trees left standing have proven themselves durable enough to survive future storms as well. It's also possible that some left standing have been traumatized in ways that will be expressed over the next few years, and that some that were protected from winds from the east could prove vulnerable if the next great winds come from a different direction. The one thing that's clear is that no one's in a hurry to find out. When is pavement a good thing in a wetland? Take the example of Rogers Refuge, a special spot in Princeton just below the Institute Woods. It's owned by the American Water Company. They have a few wells there, but it also serves as a haven for 200 species of birds attracted to its deep forests and extensive marshes. The Friends of Rogers Refuge (composed mostly of birders--I'm the guest plant person) has worked with the water company and Princeton township to manage the wetland as bird habitat. Near the water plant is a kiosk and several observation platforms overlooking the marsh, open to the public and all accessed via a gravel road off of West Drive. The road, built long before laws were passed to discourage building in floodplains, impedes the flow of water from the upper marsh (on the right) to the lower marsh (left). When the nearby Stonybrook River floods, like it did last week, it swells into the marsh and sends water flowing over the road. Every time this happened in the past, gravel from the road would be washed into the lower marsh, and the water company would have to repair the road. Now, with pavement laid in short sections where the washouts used to occur, plants growing in the lower marsh will no longer get smothered in gravel, and there won't be an ongoing need to bring heavy equipment in to keep the road open. I'm sure state regulations and the Department of Environmental Protection made it very difficult to get permits to do this (I've heard it was a three year process! ), but the result is positive for the wetland, and for anyone wishing to visit. The most remarkable thing about this, for me personally--having advocated over the years for so many things in Princeton--was to return and find that the water company had actually gone ahead and done it. I've encouraged the township to pave a similar patch of unpaved driveway that sends gravel downstream at Mountain Lakes Preserve, but the regulatory hurdles may have proven too difficult to overcome. More info on Rogers Refuge at www.rogersrefuge.org. For those interested in better utilizing runoff in the yard, this spring I'll be teaching a course entitled Managing Runoff in the Landscape through the Princeton Adult School, beginning April 11. Registration has begun. The course is in the Personal Enrichment section on their website, princetonadultschool.org, under "home". "Water flow in the landscape can drive decisions about what to plant and where. Wet ground offers a chance to grow some of New Jersey’s most attractive and low-maintenance native species. We will visit several examples in Princeton of using runoff to aesthetic ecological advantage, including projects the instructor has contributed to Rogers Refuge, Princeton University’s stream restoration, Harrison Street Park, Princeton High School’s Ecolab wetland, and constructed raingardens large and small. By studying these examples, participants will gain knowledge of native plants and ideas for managing runoff in their own yards." Reality check here. Two days after Christmas. No creatures stirring in the house. Mousetrap empty. Stockings still hung by the chimney with care. Visit from Santa? Check, but how did he get through the wood stove? Children still nestled all snug in their beds? No doubt. It's vacation. Sugar plums dancing in their heads? There always seems to be something dancing in their heads. I sprang from my desk to see what was the mutter. Away from the window, I flew like a flash. Searched for my camera amongst all the trash. It came at 8am on this grey, overcast morning, drawn by the backyard miniponds swollen by recent rains. For the first minute, the breeze ruffling its neck feathers, it stood still but for its head, shifting angles of sight, perusing the watery scene. Whether its extraordinary state of alertness was devoted to sensing potential danger or potential food, I couldn't say. down the reconstructed channel and floodplain planted with native water-loving sedges, rushes, and wildflowers, past a firewood sculpture that keeps an eye on the backyard, and finally under the lower fence, to run the gauntlet between two neighbors' homes built before building was banned in floodplains. Not finding what it wanted in our ponds, the heron checked out our driveway "retention basin". Note the clouds in the sky that look just like leaves. Actually, oh, sorry, this photo is upside down. Here we go. That's better. One reason I put little faith in pipes to drain things like driveways is that the pipes tend to get blocked. The one here was clogged or crushed by a tree, which we finally cut down. Routing, excavation--all have been attempted, to no avail. However, perhaps the tree roots are starting to rot away, because the pipe has begun to work again, making the driveway act like a retention basin that catches stormwater runoff, then releases it slowly into the local waterway, which as mentioned happens to coincide with our backyard. We contribute less to downstream flooding, and we get visits from distinguished guests. Not a bad deal. I like to think the heron was fooled by our swollen pondlets just like I was as a kid, living for a month on top of a mountain in Texas while my dad was on an observing run at McDonald Observatory. At the base of the mountain was a pond full of catfish that we had much success catching during long evenings before my dad headed up to the telescope, to scrutinize the depths of the universe for the night. That part of Texas was known for its lack of rain, which is why the observatory was there. But one afternoon, a single large cloud appeared on the horizon in an otherwise blue sky. It came right over us, as if on a mission, dumped its thick rain upon us, then left within an hour. I looked down the mountain and saw the pond had tripled in size. Maybe it was all of those Field and Stream magazines I was reading, but to my thinking the swollen pond meant that the fish had tripled in size as well. I was so excited I hiked all the way down the mountain, sugar plummed lunker fish dancing in my head, and cast my line into the sprawling, muddy waters, expecting great things. Not a single fish. Slowly it dawned on me that there still were the same number of fish, and they hadn't grown. They were just more spread out and they couldn't see the bait because of all the muddy runoff. I was, in the true sense of the word, dis-illusioned. But in retrospect it made for a great hike. Before I could rouse the kids this morning, the heron flew off into the bleak morning sky, to grace some other place, and hopefully return after some future rain, to lend our modest waters its deep scrutiny. The snow came Christmas eve and lingered until mid-morning today, long enough to lubricate Santa's sleigh. We opened the wood stove's doors long enough to add the fire's soulful presence to the present opening. Then came a walk among the boulders and ghostly beech trees of Herrontown Woods. The beeches hold their light brown leaves, making for a nice effect. If you see two small ducks walking with us, it must be your imagination. There's plenty of evidence of what Princeton has been through this fall. Moss has a good growth strategy for surviving wind storms. And then, driving home on Snowden, a sighting of wild turkeys. Ten of them crossed the road, presumably for the same reason chickens do. Following perhaps fifty feet behind, keeping an eye on everyone and everything, was the largest turkey of all, a male with a prominent "beard". According to Princeton's animal control officer, Mark Johnson, there are 50-60 wild turkeys in Princeton. I hear they are fairly common in the Little Brook neighborhood. To more fully appreciate the magnificence of these birds, I highly recommend the one hour PBS documentary, My Life as a Turkey. It can be watched online, or at the Princeton Environmental Film Festival a month from now. The first 81 acres of Herrontown Woods were donated to the county back in 1957 by a famous mathematician and his wife, Oswald and Elizabeth Veblen. They lived the last decades of their lives there, in the Veblen House, clearly in love with the dot and line woodlands of the ridge. And so it was, and so has much more been preserved over the decades, building on that simple but central vision of a place to go walk and sit. The romance of the dot and the line ends with a moral: "To the vector belong the spoils." We are surely the vectors, imbued with direction and magnitude, with many trails and vistas to call our own. One easy way to provide habitat in the backyard is to build a wood pile, even if one isn't intending to use the wood. We happen to use the wood, which brings discovery of just how varied and inviting are all the protected spaces these highrise hotels create. Wooly bear caterpillars curl up inbetween logs. This beetle liked a particular furrow in the bark. Little ant hamlets, with ants larger than the variety that invade the home but much smaller than carpenter ants, cluster on small hollows in the split wood. And a spider looked to be spending the winter sprawled protectively over its well webbed brood tucked in a knothole. All this microlife makes naturalists slow wood gatherers, given the need to at least try to spare these animals, there homes set aside where they can remain through the winter. After several years of sculpting primarily pumpkins, the Master of Gnaw appears to be experimenting with new materials. Past work below, and further riffing on this new development at the PrincetonPrimer blog. Nothing symbolizes so well the quandary of the future as the question of how to shade play equipment in a park. Back when I was frequenting playgrounds with my kids, in various parts of the country, we'd typically find the play equipment lacked shade and would get searing hot in summer sun. The equipment would be rendered useless for hours, because no one had thought to plant a tree in the right place years before. Oftentimes, trees had been planted elsewhere in a park, but not in strategic locations where their shade would do the most good. So when a couple wanted to plant a tree in the park behind my house to celebrate the birth of their son a few years ago, I suggested we plant it southwest of the new play structure, so that its limbs would eventually provide shade during the hottest hours of the day. I showed the tree to a town arborist the other day, and he joked that he will have long since retired to Florida by the time the tree is shading the play structure. I offered that he might be saved a trip, given how quickly Florida's weather is migrating northward. It's not surprising that staff would be less than passionate about a well-shaded future, given a necessary preoccupation with keeping a storm-ravaged town functioning in the present. And when I look at the tree and see how far it has to go, it does seem a leap of faith. How else, though, does one make cool, delicious shade happen other than to make that leap? The future will come sooner than we think. Trees grow--the evidence is all around--and yet playgrounds across the land roast for lack of shade. There's another kind of play and exercise that parks need to foster--the play of the imagination, leaps of faith--so that we might better see, and shade, the future. Yesterday, while looking out across the bleak backyard landscape, one small point of bright yellow caught my eye. A dandelion, audacious or rightfully confused by all the weather's mixed signals. 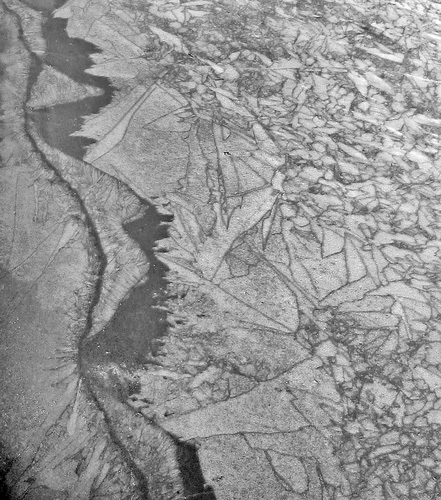 I was very honored recently to hear that the eminent photographer Emmet Gowin chose to include my photograph of Carnegie Lake ice in a traveling exhibit of photographs, selected from the Princeton University's Art of Science collection. Assisting in selection was Joel Smith, former Curator of Photography at the Princeton Art Museum. "Energy drives water's greatness. No molecule responds more brilliantly than water to the energy regime negotiated by the planet's atmosphere. If there were a physical template that drove the evolution of our imaginations, it would be water. Water is the ultimate artist, a renaissance molecule, exploring endless patterns and textures and playing with light as it shifts nimbly from solid to liquid to gas. Glaciers and rivers are channeled energy, but in a lake, water is trapped, and must do its work within the frame of a shoreline. A steady exodus of energy yields congealed, dark ice. But more often, the process is complex — a series of freezes and thaws, compressions and expansions. One day this past January, crossing the Harrison Street bridge, I happened to look over and noticed that all of Carnegie Lake had taken on the rich patterns of a giant, horizontal stained glass window. This close-up is part of a comparative exploration of the forces driving creativity in people and in nature." Other photos from that very unusual "frozen moment" in the lake's history are documented in a March 4, 2010 post on this blog. I also had a photo in the 2009 Art of Science exhibit, taken a previous time when Carnegie Lake froze thick enough to skate on. The university's "best of" traveling show (facebook version here) of 45 images, selected from more than 250 images in past Princeton Art of Science exhibits, will continue through March 17, 2013 at the Liberty Science Center (LSC.org), located in Liberty State Park, not far from the Statue of Liberty. You can see the current Art of Science exhibit on display in the main walkway at the university's Friends Center, or go to princeton.edu/artofscience. There's a trail in here somewhere. These photos, taken by Eric Tazelaar, document a weekend of volunteer work to open up trails through whatever Hurricane Sandy left of the pine woods at Community Park North. Clark Lennon, one of the lead members of the FOPOS (Friends of Princeton Open Space) trails committee, did a lot of the chainsaw work. Here's a good action shot. up into its original position. Second and third from the left, and second from the right, are Ted Thomas, Clark Lennon and Andrew Thornton--longtime members of the trails committee. I unfortunately don't recognize the others, but heard that some other local groups sent volunteers, including Blue Mountain Sports. This shot includes Wendy Mager, president of FOPOS, who has led so many successful efforts to preserve open space in Princeton. Some 40 trees were cleared from trails on that Saturday (Nov. 10) and "many more than that" on Sunday. With all the windstorms and nor'easters that have come through Princeton in recent years, there simply would be no trails to walk on without these efforts. When Tim Patrick-Miller, a longtime Friends of Princeton Open Space board member, sought volunteers to move 9 flowering dogwoods to Mountain Lakes, we answered the call. The township grew the trees at its Smoyer Park nursery, but as trees in a nursery gain inertia with each growing season, it sometimes takes someone with exceptional determination to actually dig them up and give them a home out in the real world. The real world, of course, has become a lot less shady since Hurricane Sandy, and these trees were headed to spots near Mountain Lakes House where the canopy has opened up. In this photo, trail committee member Clark Lennon waved encouragement while Andrew Thornton and Tim heaved and hoed. in lieu of heavy lifting. So in this fine photo with fellow habitat restorationists, AeLin Compton and Andrew, my shovel is looking pretty ornamental.